PLEASE NOTE THAT ROUNDS ARE PICKED AT THE TIME OF ORDER FULFILLMENT. WE CANNOT GUARANTEE WHAT YEAR YOU WILL RECEIVE, HOWEVER, IT WILL BE EITHER 2018 OR 2019. Many of the most beautiful silver coin designs in American history didn’t appear first on bullion or commemorative coinage, but rather on the nation’s circulation currency. From time to time, private mints will reimagine these designs on low-mintage silver rounds that offer a different option for investors and collectors alike. Such is the case with Freedom Girl. Right now, 1 oz Silver Freedom Girl Shield Rounds are available to purchase online at Silver.com. Ships to you within plastic flips or tubes of 20 rounds! The most popular design to date in the Silver Shield Collection! The obverse side of the round features Freedom Girl, the Golden State Mint’s take on Lady Liberty from the Peace Dollar. 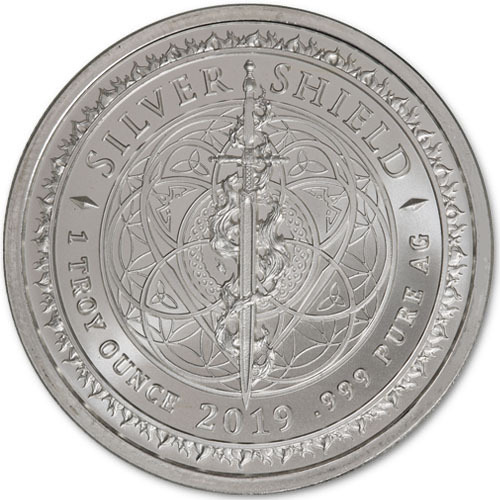 On the reverse face of the round includes the Silver Shield design. Each of the 1 oz Silver Freedom Girl Shield Rounds from the Golden State Mint is available to you inside of protective packaging. Individual rounds purchased through this listing arrive inside of protective flips, while multiples of 20 rounds are available in tubes. The Freedom Girl design is the most popular in the Silver Shield Collection, so don’t wait to make your purchase! Freedom Girl is the Golden State Mint’s vision of Lady Liberty as originally depicted on the Peace Silver Dollar. First issued in 1921, the Peace Dollar was the last silver dollar coin in circulation from the United States Mint. It was available from 1921 to 1928, and again in 1934 and 1935. Anthony de Francisci created the image of Lady Liberty on the face of the Peace Dollar. His wife Teresa served as his inspiration for the image of the Goddess of Liberty. His goal was to create a coin that resonated through its design the desire of a war-weary nation to put the horrors of World War I to bed in hopes of a brighter, more peaceful future. On the obverse of the 1 oz Silver Freedom Girl Shield Round is a new vision for Liberty. 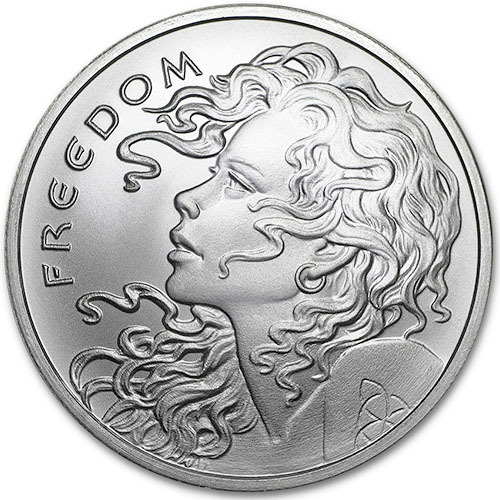 This design captures a left-profile portrait of Liberty known as the Freedom Girl. Her long, curly locks of hair flow down over her shoulder and blow across her face in the breeze. If you have any questions, feel free to reach out to Silver.com. Our customer service associates are available to you at 888-989-7223, online using our live chat service, and via our email address.